Real talk – even personal trainers and fitness professionals struggle with weight loss, bad eating habits, and needing motivation to exercise. For me, my eating habits the last several months have been garbage. A lot more pizza, cheese, and sweets than I used to eat. And it was starting to show. I suspected that I’d put on some pounds, and when a friend of mine commented that I looked like I was “getting a little thick around the waist” I knew I needed to get things in check. I weighed myself and found that I’d gotten back up to 218 lbs. My normal “feel good” weight is about 200-195. So I knew I needed to do something to make a change. Right on time, Jessica at 24/7 Health and Fitness Center started a Whole 30 challenge for the month of August 2016. I’d heard about the Whole 30 in passing on various blogs and social media but never looked at it in detail. In reading over the program, it seemed doable and a good way to reset my eating habits. After all, it was for only 30 days. So with nothing else to lose but some weight, my wife and I decided to give the program a go for the month of August. 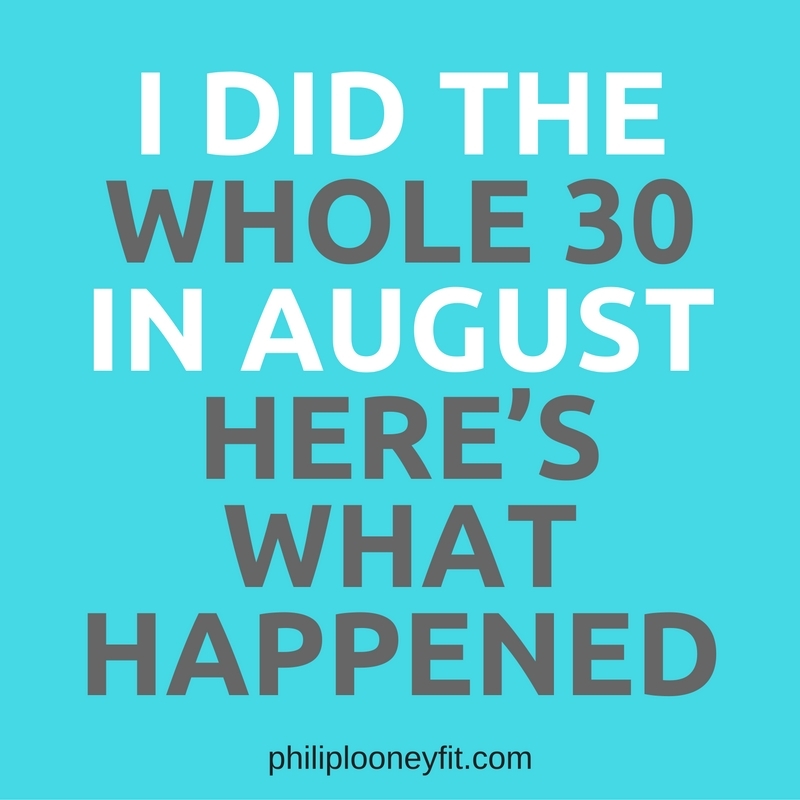 If I was asked to describe the Whole 30 in just a sentence or two (and I have, as a lot of friends have asked me about it), I would say to think of it as a metabolic and nutritional reset to help you break bad eating habits and also identify if you have any food allergies. The book Whole 30: The 30 Day Guide to Total Health and Food Freedom (Amazon) outlines in detail the core principles of the program, the reasons why certain foods are eliminated, and the things you can eat. You can also get a summery of the program rules at Whole30.com, but I highly recommend purchasing the book since it gives a deeper dive, and sets an expectation of how you should feel and what you should experience along different day markers of the program. The book also has a lot of great recipes that I referred back to often during the challenge. I would say to think of it as a metabolic and nutritional reset to help you break bad eating habits and also identify if you have any food allergies. Essentially, the rules are simple. You can’t eat any grains (no rice, wheat, etc. ), no beans, no added sugar (including honey) or sugar substitutes like stevia, no dairy, no peanuts, no soy, and no sulfates or nitrates. There are also a lot of other preservatives you have to avoid so you’ll find yourself googling certain ingredients of packaged foods to see if you can have something. 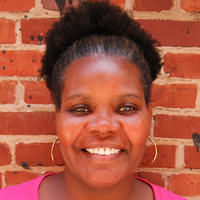 The focus is on eating whole foods like quality meats, fruits, and vegetables. Any packaged foods you eat should contain very few ingredients, and are best if you can recognize those ingredients easily without using the aforementioned Google search. This means you can actually eat a lot of different foods, and my wife and I found it best to focus on the things you can have rather than the things you can’t. You can have pretty much all of the meats – beef, chicken, pork, seafood, etc. You can eat fruits and veggies, other types of nuts like almonds, walnuts, and pistachios, and you can eat quality fats like olive oil and coconut oils. You can also use all of kinds of spices, except those with MSG; which surprisingly a lot of spices have buried in them, even things like some brands of ground ginger. You can also eat potatoes, which for me was the game changer. More on that later. The plan is really about trying to identify if there are certain foods that you have allergies to. The list of foods you are to avoid can cause inflammation and allergic reactions in some people. By removing these from your diet, and then slowly reintroducing them, you should be able to see what might be a problem area for you. Of course, if you’re cutting out sugars and grains, you’re bound to lose weight as well, which was my goal. Really, the challenge starts before you even beginning following the rules. 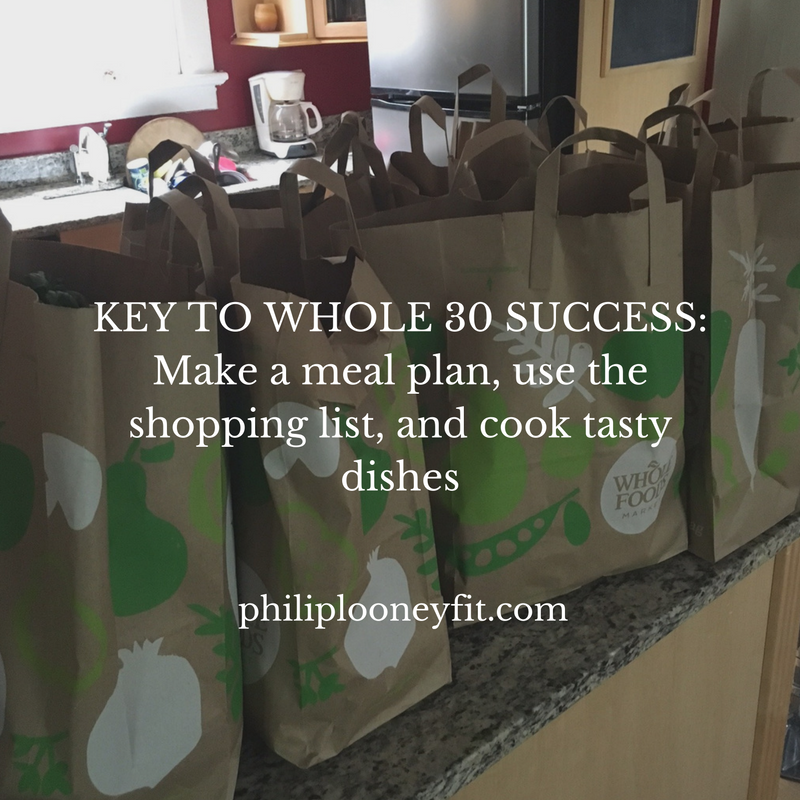 Reading the Whole 30 track, step 5 of preparing the home and planning was key. We got rid of anything that would be a temptation. We gave away foods that would spoil in 30 days like cheese, and set foods like rice and sauces that weren’t Whole 30 compliant on a higher shelf in the pantry. I realized that cooking at home was going to be a key to success, so I made a meal plan for the first 3 days of the program so I’d know what we had to eat and not be stuck. I made a shopping list and headed out to Whole Foods to get the party started. Hands down, Week 1 was the hardest, especially days 2 and 3. I totally expected this, not only because the Whole 30 book warns you that this will be the case, but based on my my experience with low carbohydrate diets in the past. The entire first week, I had lower than normal energy levels. That said, the “low carb flu” was not quite as bad for me as previous attempts to cut carbs and sugar because of being able to eat potatoes. Potatoes were my saving grace through out this program. As someone who lives a very active lifestyle – running, riding my bike, lifting weights, etc. – I knew going in that potatoes would be key to getting in the carbohydrates I’d need in order to have any kind of energy levels to perform. I ate potatoes with about 80% of my meals during the challenge. Lots of roasted red potatoes, sweet potato hash, and home fries. Being able to eat potatoes was an important key to sticking to the challenge and getting through that first week. Disclaimer, I did get sick of potatoes about half way in. The first couple of weeks, there were a few of cravings to contend with. My biggest craving without a doubt was for tacos. I realized that my wife and I had gotten into a habit of eating out a lot, and my usual default setting for places to go out to eat is Mexican food. So while I couldn’t have corn or cheese on the Whole 30, I did learn to counteract the craving with sweet potatoes stuffed with taco meat, and some home made salsa. Another craving was wanting a glass of red wine during a steak dinner. Just something about a good Malbec with a piece of beef that really sets it off. As I mentioned earlier, during those first two weeks, low energy was a real challenge. The impact in my life was not really being able to workout as hard as I wanted to. The first week it really effected my workouts, especially running and sports. I know the first couple of runs I did I got seriously dehydrated after running in the heat for an hour with no sports drinks to replenish electrolytes with. I did find a good, Whole 30 approved substitute for sports drinks that helped. Reading the forums, one of the founders Dallas Hartwig made suggestion of watered down mango juice in a 3:1 ratio with a pinch of salt. This was a big help in combating dehydration issues on long runs. The other big challenge we faced was just not eating out. I know, poor me; save some money, eat healthier, what’s the big deal? But what I came to realize during the Whole 30 challenge is that eating is really a social. Not being able to eat out makes you more anti-social, so you don’t spend as much time with your friends because you’re trying to stick to the challenge. The reason you avoid eating out is that so much restaurant food is not going to be Whole 30 compliant, for the simple fact that there is so much hidden sugar in things. A prime example was when I went to a fast/casual Greek place and wanted to order the grilled steak. I asked about the seasoning they used, and sure enough it had sugar in it. I hate to be “that guy” who goes to a restaurant and has to inquire about ever item on the menu to find out if it contains soy or sugar or whatever. So in order to make sure I was eating Whole 30 compliant foods, it was just easier to cook at home. But honestly, after I got through the first 7 or 8 days? It was all downhill from there. I got into an easy groove of cooking foods that I liked, trying some new recipes, and having plenty of leftovers on hand to grab a quick bite to eat. I really got to refine some cooking skills and used a lot of the kitchen gadgets that I’d never used (my potato peeler had never been used until this challenge). This was a big positive to be able to do somethign fun like making new dishes, and to eat healthy at the same time. Nutpods – I tried it. I really did. But drinking black coffee is just not me. Not being able to sit down and enjoy a cup of coffee in the morning was very difficult during those first few days, but Nutpods were a game changer. Nutpods are unsweetened, non-diary creamer that use almond and coconut milk to make a creamer that’s actually smooth and creamy and tastes almost like the real thing. If you’re a coffee fiend, I recommend getting these. Sauces – I underrated just how much sauces play a part in meals. I read in the book to go ahead and prep a bunch of sauces, and thought to myself “well, I’ll be ok without ketchup.” I was wrong. Spend some time making your own ketchup. It’s really easy if you have a blender. Also, make your own salsa. I had a lot of fun experimenting with mango salsa and peach salsa that if I’d gotten store bought would have had added sugars. Meal Planning – I really can’t stress this enough. Meal planning was a key to success. I began to realize one of the reasons I tend to eat out so much is from being in a rush and not having the time to cook. Having pre-made meals was a big help to saving time and fighting the urge to eat out. My biggest take away from this challenge is that there are a TON of additives in the food we buy. Granted this is something I “knew” but really just didn’t realize how extensive it is until I started looking at more labels. And it’s not just the weird added preservative chemicals, but the added sugar in so much food; even things that are supposed to be “good” for you or organic. Remember – organic cane sugar is still sugar. My other take away was just how lax my personal eating habits had become. I’d slipped into a mode of justifying eating junk foods more frequently because I’d justify it by saying I’d burn it off. More snacking than I needed to do, and not really on good things.You can’t outwork a bad diet, and that becomes more true the older we get. I’m over 35 now, and my metabolism is really only going to slow down no matter how active I am. This nutritional reset helped me focus in on those habits, and I feel like now I’m in a better place to identify them and correct them. So the big question – “how much did you lose”? I mentioned on my Facebook Live video that I’d lost 8 pounds, but I probably weighted at the wrong time. I’d say I actually lost 10 pounds in the 30 days, after doing a second weigh in the next day. I’m very happy with this as it’s a sustainable weight loss of about 2 pounds per week. Losing anything more than 2 pounds per week is just not healthy or sustainable. If you try to do the Whole 30, your results may vary. Overall, I think the Whole 30 was a good challenge for me and my family, and I’m happy with the overall results. Compared to some “diets” or eating plans, it was a more balanced approach with a focus on whole foods like quality meats, vegetables, and fruits. Overall, I think many of the principles of eating more fruits and veggies rather than highly processed foods will be something that I try to carry over as I move forward. That said, for me it would be incredibly difficult to maintain this eating style for the long term. The impact to my social life was too great, and I didn’t like not having the freedom to eat what I wanted within limit. Overall, it was a good experience and a nice reset to how I think about food. The Whole 30 Off Roading guide is going to be something I try to follow so that I can keep the better habits going forward. If you’re thinking about a trying the Whole 30, please check out Whole30.com, or if you have questions on my experience please leave a comment below. Thanks for sharing about us, Phil! I’m with you. I couldn’t do black coffee either; which is why I created nutpods when the choices on the market didn’t work for me – taste and ingredient wise. Please know that we read and appreciate our fans sharing about products and congrats on finishing your W30! It’s fantastic Madeline! Thanks for creating a great product, and really hope it takes off. Even though we’re not doing a Whole 30 right now, my wife and I are still using Nutpods as our coffee creamer of choice.